Patients and families are invited to attend the Myelodysplastic Syndromes & Aplastic Anaemia & Acute Myeloid Leukaemia local support group meetings for the London area at King’s College Hospital London. This is a greater London specific meeting. You do not need to be a King’s patient to attend. 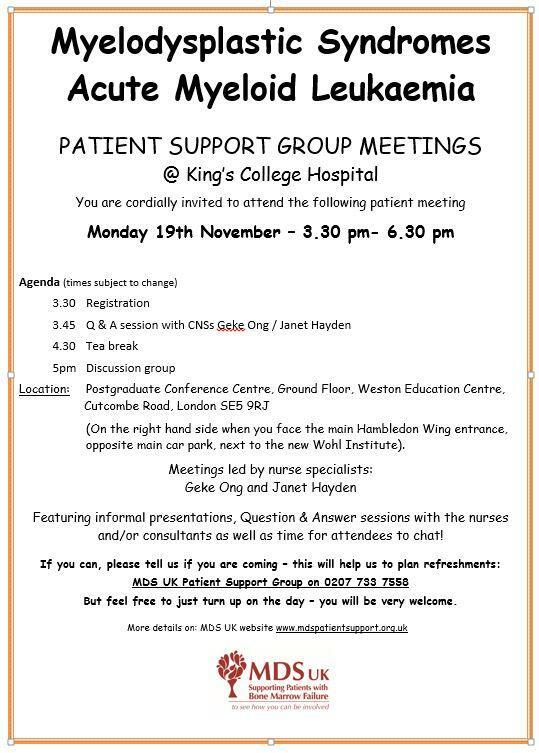 Come and talk to other patients and clinical staff, get new information or help. Meetings are held after KCH clinics. The building is located between Hambleden Wing and the new Wohl Neurological Institute, opposite the main hospital car park entrance. Suggestions for talk topics welcome - this is YOUR group! If you have never contacted MDS UK, please contact us for a full Patient Information Pack before attending the Support Group. If you have not contacted the MDS UK Patient Support Group before and would like to receive a full Patient Information Pack, please contact our Main Office.